You can project the dashboard data on a big screen TV in your contact center floor with just a couple of clicks. 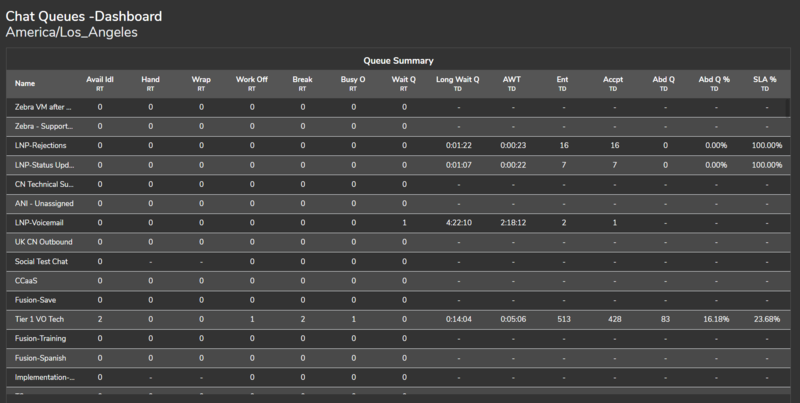 For example, view the queue summary stats in real time, past 15 minutes, or for the entire day, and share it with others. While sharing, you can specify the screen size and optimal viewing distance. Provide valuable metrics to your call center agents as they work. View real-time metrics to display the latest information on call center service, or change the time range to the past 15 minutes or the past day to give a more complete picture of call center activity. From the list of dashboards, click next to the desired dashboard, select Share Dashboard from the menu. In the following screen, click next to the shareable wallboard link. Set the wallboard background color to either light or dark, and set the viewing distance (in feet). Click to copy the wallboard shareable link to your clipboard. Open your favorite email application, and share the link via email with the desired recipients.